Waking up to a delicious warm breakfast on Christmas morning is a special experience for kids and adults alike. 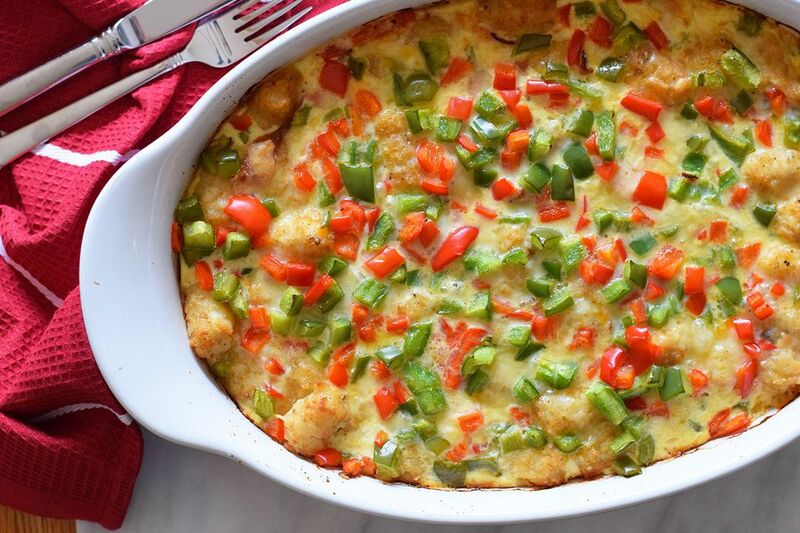 Whether you're feeding family or you've got a houseful of holiday guests coming over for brunch, these crowd-pleasing Christmas breakfast casseroles will satisfy everyone's taste buds. To make things easy on you as a holiday host, these sweet and savory recipes can be assembled a day or more in advance or cooked overnight in your crockpot. Consider it our gift to you this holiday season! Panettone is a buttery, sweet Italian bread filled with dried fruit that's eaten at the holidays. This recipe turns it into French toast, forming a festive custardy casserole to serve on Christmas morning. You can prepare it the night before and refrigerate for stress-free morning. Or wake, make, bake, and serve it immediately for firmer toast. Get your family's energy up for gift-opening with this easy, cheesy, sausage and egg bake that uses frozen biscuits as the base. Cranberry sauce would be a great seasonal topping to bring out the savory flavors of this dish. Do your kids beg you for hash browns and bacon? Make their breakfast wishes come true when you serve this creamy casserole that combines both the morning staples in one dish. Store-bought hash browns are combined with eggs, bacon, cheddar cheese, and chopped bell peppers, then baked until golden brown and bubbly. Bananas foster is a decadent New Orleans dessert usually served via table-side flambé. 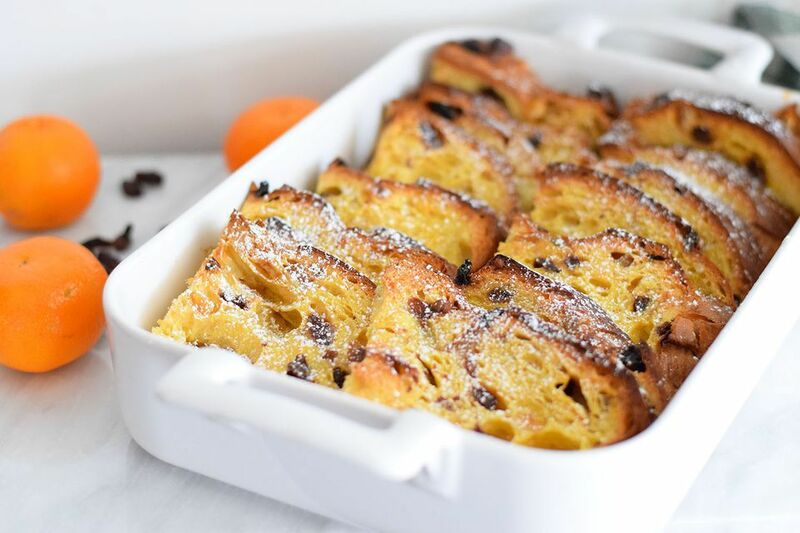 This recipe takes the flavors of the iconic dessert and turns it into a French toast casserole version that fills your kitchen with the holiday baking aromas of cinnamon, vanilla, brown sugar, and optional dark rum. The mouthwatering aromas of sweet potatoes and spicy chorizo sausage may cause a stampede to the table! Add a sprinkle of cinnamon on top for extra Christmas cheer. Best of all, this Southern-style breakfast casserole can be prepped and chilled a day or two before baking. You can also drop this recipe into muffin cups for a handheld treat the kids will love to eat around the tree. Throw together a hearty vegetarian meal when you wake up or prep it quickly the night before. Either way, it won't take long—this tasty casserole only requires 15 minutes to assemble. The recipe makes good use of vegetarian sausage substitute, so meat eaters will enjoy it, too. Enjoy it with vegan cinnamon rolls for a Christmas breakfast that covers both sweet and savory. Here's an awesome make-ahead French toast bake that your family will demand every year. Dried cherries and cherry preserves add festive a color and flavor to the bread, which taste fabulous drizzled with warm maple syrup and melted butter. If you want to make life during the holidays, save this recipe for a layered breakfast casserole that cooks overnight in the crockpot. As you sleep, the ham, eggs, hash browns, bell peppers, and cheddar cheese will all come together to form a breakfast the entire family will adore. It makes a filling morning meal, especially with a slice of hot buttered cinnamon toast. Chicken sausages and just a few other ingredients, including loads of cheddar cheese, add up to plenty of flavor in this wake-and-bake casserole. This hearty casserole dotted with festive red and green bell peppers is a delicious way to use up leftover Christmas Eve ham (you can use deli ham or sausage, too). Mix it the night before and pop it in the oven to bake in the morning. Make it as suggested with tater tots, or sub in shredded hash browns to suit your family's tastes. Want to add Tex-Mex flair to your holiday morning? This crockpot casserole filled with jalapenos, chili, and Monterey Jack cheese cooks while you sleep for a spicy Christmas breakfast that's ready when you are. It's great served with corn muffins, with added cranberries in the batter to make them merry. Are you a planner? This breakfast bake freezes beautifully, so it can be made far in advance for reheating on Christmas morning. It also looks impressive, with layers of buttery filo pastry sandwiching the sausage and egg filling. Reheat it in under an hour on Christmas day for a brunch that's truly party ready. This buttery egg and croissant bake is scented with cinnamon, vanilla, and brown sugar, and sprinkled with old-fashioned streusel topping. Frozen or fresh blueberries are used in this recipe, but you can also make it with frozen dark sweet cherries for an extra Christmas-y treat. Here's a meaty, eggy make-ahead brunch that makes great use of leftovers. Combine baked Christmas ham or corned beef with frozen spinach, cubed bread, eggs, and a whole lot of cheese and bake until bubbly. Comfort food is here! Tater tots, Canadian bacon, onions, eggs, and cheese cook overnight in a crockpot to make this stomach-filling dish that kids will want seconds of. If you love Southern cooking, get your holiday morning off on the right foot with this breakfast bake, which can be assembled the night before. Cooked sausage patties and Cajun seasoning add a down-home feel. Enjoy it with a glass of eggnog in place of milk—it is Christmas morning after all!